Two men, one name: STOUT! Mario Kuzyna, old folk-veteran and Simon Scherer, bearded banjo-beast, have joined in the mission to breathe new life into irish folk reachning from traditional to modern and back. Willing to take detours and side-roads. FINALLY listening examples from our album!!! It’s finally done, we can give you some teasers of three tracks from our upcoming debut. You find them right HERE! Enjoy them, we are heading forward, it will be done in a few weeks now… We are over-excited! A last hello from the studio! The day anyway went very smooth foor us as we already finished recording our own tracks and only listened to Uwe. Everything went on quite fast and smooth and was big fun for all of us. Simon was a bit frustrated before the end, ’cause a „little“ correction took quite a long time, but even that was done at the end of the day. We then listened to every new track (and those with Bodhrán added) and went to have dinner absolutely satisfied afterwards. We had two fantastic recording-weeks, we have all tracks we need and the result is coming really close now. We gave everything we had and like it. Hopefully you’ll do, too. Here are also all pics of the two weeks. MANY MANY THANKS TO BÉA, who let us live at her house, had much patience with us, called us to reason many times and took much care of us. There wouldn’t be a STOUT-record without you for quite a long time. Your the best! 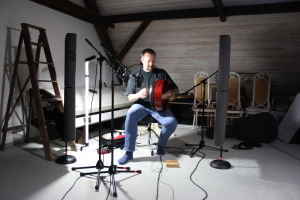 A huge thanks to Uwe also for the funny day and some first-class Bodhrán-tracks.